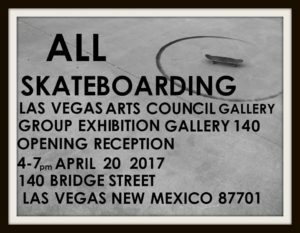 Gallery 140 was proud to present “All Skateboarding,” a collaboration of artists celebrating the community and culture of skateboarding, and raising funds and enthusiasm for a new, state-0f-the-art skate park serving the youth of Las Vegas. Curated by recent NMHU graduate Brian Marquez, there were pieces for display and many for sale. Paintings and collages on skateboards by Marquez, Pablo Pekoc, Magali Rutschman, Amber MacLean, and more, photographs of skateboarders in action, a selection of boards hand-crafted by woodwork artist Paul Bonchi, framed paintings, a cast iron and bronze loooooong board sculpture by Ben Remmers, a Meredith Britt collage, and more filled the gallery with energy, talent, and skill! The Las Vegas Arts Council’s Gallery 140 at 140 Bridge Street has a different exhibit nearly every month or two to introduce you to the art and artists of our community. Our door is open Tuesday through Saturday, from 1:00 – 4:00 pm.